For a company with the long history and sterling reputation of Strike King, you’d think that sooner or later the Tennessee -based lure maker would come to an ICAST show and rest on its laurels. Think again. 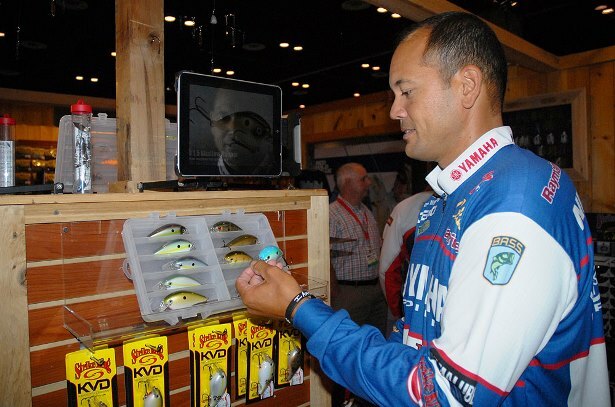 Because a visit to the company’s display booth in Orlando at the 2014 ICAST Show finds yet another wave of lure making innovation about to hit the shelves. That wave of new baits is headlined perhaps by the mega squarebill that Strike King is introducing this week, the KVD 8.0 that checks in as a much larger “big bait, big bass” lure that still retains the line’s erratic hunting motion, silent running, and cover deflecting capabilities. Niggemeyer thinks that the 8.0 squarebill will be useful in a number of settings when an angler is looking to catch a quality size bass. The 8.0, which should start hitting shelves in the next few weeks, builds on the attributes of its predecessors. “It’s just a giant version of the 2.5 body style that Kevin (VanDam) made famous,” said Mark Copley, Strike King’s media and public relations man. Copley says that there has been a lot of buzz this week at ICAST about the new bait. Notice the words testing and prototypes? Copley said that few, if any, baits that Strike King makes ever hit the shelves without months – or even years – of testing. Copley said that those new lures went through strenuous testing as Strike King enters that specie’s hard-bait market for the first time. And they enter that market with all of their ducks in a row after getting plenty of seasoned input from walleye specialists and pros. Even from a Strike King pro who is far better known for his prowess at catching another species. “Kevin actually helped test our walleye baits,” said Copley. “He’s from Michigan and what a lot of people don’t know is that he is also a dynamite walleye fisherman as well as one of the best bass pros there is. So what exactly is the process of getting a Strike King bait – be it a bass lure, a walleye lure, or a panfish lure – created and into the hands of the company’s touring pros and consumers? “We’ll come up with a concept, talk with our pros and get their input, research what’s out there and then see if we can make something that no one else is making or do it in a way that is even better,” said Copley. If so, then it’s off to production, right? Not really says Copley. The Strike King pro staff, which includes Major League Fishing pros Kevin VanDam, Denny Brauer, Mark Davis, Shaw Grigsby, Greg Hackney, Todd Faircloth, Andy Montgomery, Keith Combs, and Mark Rose, will then go to work casting the baits into the water and putting them to the test. But even then, the process is far from over as Strike King head lure designer Phil Marks gets even more heavily involved in the process. “Phil will get all of this initial information back and talk to the pros so that he can get even more input on the lure,” said Copley. Then it’s back to the drawing board again. “After Phil gets all of the pro’s feedback, then we’ll start tweaking the baits and making any changes that we need to like adjusting the bill shape and size, moving weight around in the bait, adjusting any internal chamber locations and balancing the bait out,” said Copley. Once that happens, Marks will usually be ready to sign off on the bait, which triggers a company goal of having the bait to Strike King’s distribution channels in less than 90 days. Maybe, says Crispin Powley, Strike King’s factory account manager. “Usually, we’re still going to keep looking at the bait to make sure it’s right even after Phil signs off on it,” said Powley. Eventually, all lights are green and the bait goes into production and begins to hit shelves at stores and online vendors around the country. And when those lures do do, it almost seems as if they are destined for success given the extensive prototype testing that Strike King does, the fishing and marketing talents of the company’s big pro staff and the reputation of the company’s brand. The new walleye lures from Strike King are a perfect example of this process. For Strike King, one of the lure making industry’s longtime giants, they usually do. 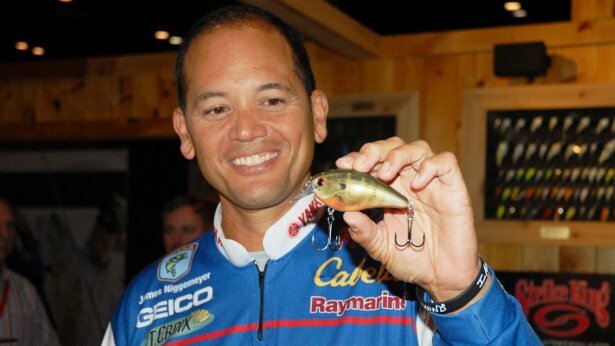 Just ask Kevin VanDam, legendary bass fisherman by day, closet walleye lure tester by night.